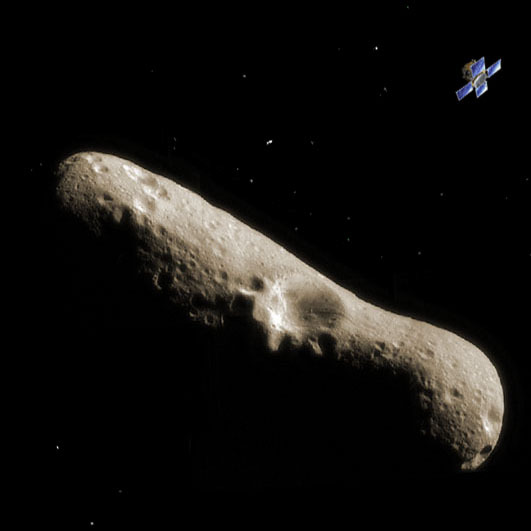 One of the recent and ongoing successful NASA missions is NEAR (Near Earth Asteroid Rendezvous) Spececraft sent to two asteroids: 253 Mathilde and 433 Eros. With the concentration on the second one. The Johns Hopkins University Applied Physics Laboratory (APL) designed and built the ship and NEAR was launched on February 17, 1996, $125 million spacecraft operates on a 16-bit machine called a 1750A. Based on a military standard that is about 10 years old, it runs at 12 MHz and has 256 KB of storage. When it reached Eros on Feb. 14, NEAR had traveled 3.018 billion kilometers. It will travel another 674 million kilometers during its yearlong orbit. NEAR will travel various distances around Eros. It will spend 125 days in an orbit 50 kilometers from the center of Eros; at other times its orbit will extend to about 500 kilometers. In December 2000 it will descend to 35 kilometers and operate from that distance (or closer) for the rest of the mission. Potato-shaped Eros is about 33 kilometers long, 13 kilometers wide and 13 kilometers thick. Most of the near-Earth asteroids we know about are 1 kilometer across. NEAR made some really cool photographs of Eros.